The weight pressure of transferred material load was causing the conveyor belt to sag in between the supporting rollers. Belt edge sag allows the material to spill through the gaps that appear between the skirting and the belt, and as well as creating spillage. Smaller rocks have the potential to get caught between the belt and the skirting, causing premature groove lines in the belt’s top cover. Tears and blockages will occur if fines are not identified and removed. The impact of the material causes a dust problem requiring constant deployment of labour resources to clear up the dust creating a physical manual labour OHS issue as well as an environmental air pollution issue. A resolution was required to suit a confined access space around the chute. Kinder Australia recommended the installation of the K-Sure® Belt Support System to fix the problem of belt sag. 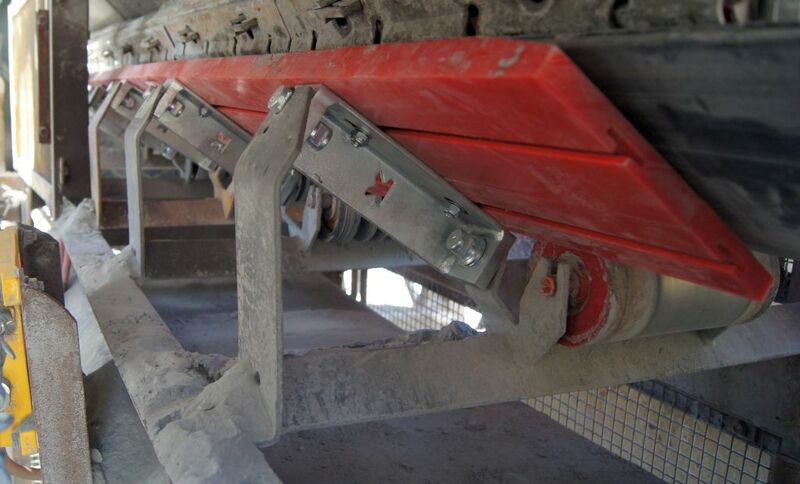 This belt support system is designed to provide even and consistent support under the belt, utilising low friction UHMWPE sliding surface bars instead of rollers. Also, with no moving parts that would wear in the future, this solution will remove the need to change rollers in the awkward space. Kinder Australia then recommended the installation of the double layered K-Ultra Dual® Seal to trap the dust particles effectively. Mounted using shallow clamps it is ideal for this confined access location. This skirt works by utilising an interior wear resistant layer of polyurethane (longer lasting than rubber skirting), but it also has an outer anti-dust integral moulding that can adapt to belt vibration and maintain the correct pressure to effectively seal the belt.